The NFL Draft's Next Stop: Nashville? Draft news in May! Just when you thought you were done reading about the NFL draft until next February, a front-runner for the next host city has emerged. ESPN’s Adam Schefter reported that Nashville is the likely destination for 2019 draft. The league is choosing between Nashville, Cleveland/Canton, Kansas City, Denver and Las Vegas, and is expected to announce the winner at the league meetings in Atlanta, May 22-23. If Nashville is the choice, it will become the smallest market to host the draft yet, ranking 22nd among the league's 32 NFL markets. The traveling roadshow drew its biggest crowd yet this year in Dallas, setting a record in first-day attendance with 100,000 fans at AT&T Stadium. It also set new television records becoming the highest-rated and most-watched draft in history. The 2017 draft in Philadelphia drew 250,000 fans over three days and generated an estimated economic impact of $95 million. It appears there is no stopping the growth and reach of the draft, and it’s a smart marketing move to bring the event to a different fan base every year. Personally, I’m excited to see all of the NFL/country music collaborations because everyone knows country boys love hunting, fishing and football. Did you know Garth Brooks loves the Steelers, Blake Shelton is a Cardinals fan and Kenny Chesney cheers for the Titans? And since the official draft day hats seem to get worse every year, it won’t be surprising if they embroider a team slogan onto actual cowboy hats next year. And the NFL isn’t doing a Nashville draft right if this sentimental Chesney song about playing high school football (ft. an emotional pregame speech by Saints coach Sean Payton) isn’t played at least once every commercial break. Quick programming note—with the NFL offseason in full swing, The MMQB’s Morning Huddle will be publishing on Tuesday and Friday mornings. Not getting this newsletter in your inbox yet? Sign up for The MMQB's Morning Huddle. NOW ON THE MMQB: Jenny Vrentas and Tim Rohan delve into the Matt Patricia fallout. How could the Lions have not known about their new hire’s sexual assault indictment in 1996? ... Albert Breer on why the Giants don’t see it as a gamble to stick with the aging Eli Manning. 1. The Detroit News reported that new Lions head coach Matt Patricia had been indicted, but not tried, in a 1996 sexual assault case. 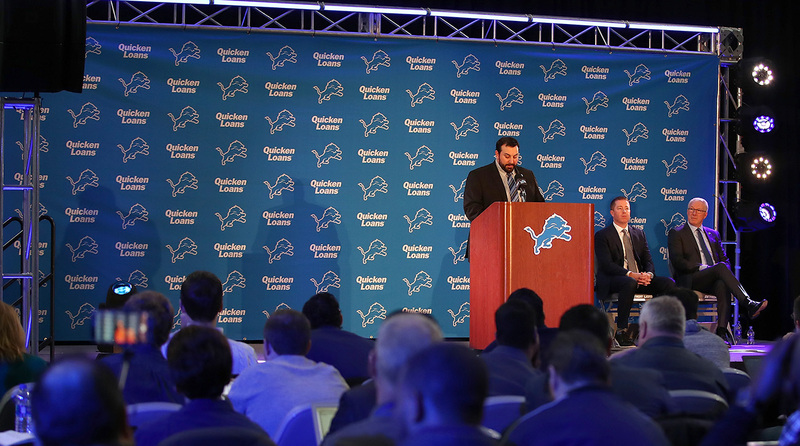 Lions president Rod Wood said the team had no knowledge of the incident before hiring Patricia in February. 2. Diana Moskovitz of Deadspin pointed out how shocking it was that the Lions didn’t know this about their new hire. It took her 30 seconds to find evidence of the case in a public records database. 3. Meet the new Monday Night Football crew, ESPN made it official: Jason Witten will be in the booth. 4. Jeremy Fowler of ESPN examines why NFL teams aren’t signing safeties. A New England zoo paid off a Super Bowl bet by naming a baby goat after Super Bowl MVP Nick Foles.